Research has shown that in an outdoor pasture, healthy cows spend around 15 hours each day lying down. 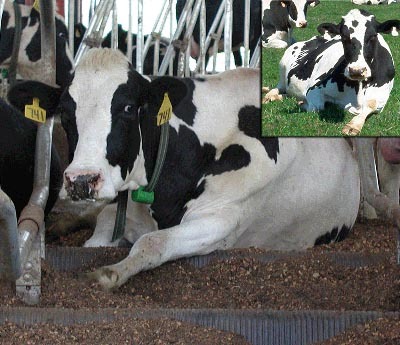 The same cows, when confined to a barn spend only 8 to 10 hours a day in a prone position. The graph below shows the ideal day for a cow according to studies. With the addition of Promat products and the the correct free stall dimensions we are able to achieve results closer to cows in Pasture. The surfaces the animals lay on obviously make the difference. Pasture is natural, resilient and comfortable while the barn floor is hard and unforgiving. Installation of the Pasture Mat System provides the ideal indoor surface for your cows' comfort - as close to natural turf as you can get. Pasture Mat reliably absorbs the shock repeated impacts and eliminates the risk of injury to-even the heaviest cow. Side-by-side tests with all other types of cow mats prove conclusively that cows prefer Pasture Mat. Pasture Mat & Comfort Pad 1.5" now gives cows more comfort than ever before. High density European foam ensures long life and maximum comfort. Our foam is designed and tested for cows and will maintain the softness for many many years!!!! The combination of the mattress and Comfort Pad with our protective top cover, is the best system available for your cows. This system is a cost effective way to increase comfort and lying times. Each grid equals 8 inches. 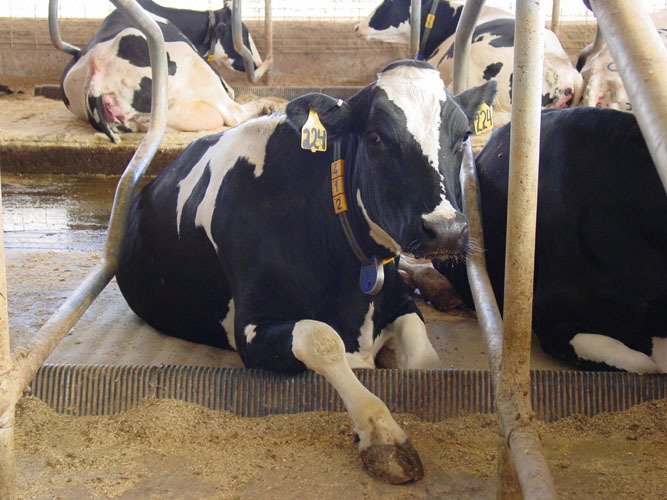 A comfortable cow is more likely to be healthy, productive and free of the stress caused by continuous discomfort. Pasture Mat provides a stall surface that is resilient - matching natural turf grass - without the bounce or sponginess of artificial materials. It provides a firm footing for your cows with no pillowing inwards and is an ideal surface for bedding materials such as chopped straw, wood shavings or sawdust. Unlike competitive mats, Pasture Mat also takes into account one vital and relatively unknown aspect of cow physiology. In the process of lying down the animal actually free falls the last 10 to 12 inches. As you can image, the impact of 1,400+ pounds of bodyweight hitting a concrete floor is considerable. The fact is, sooner or later she's going to end up with festering sores for that constant abrasion. Pasture Mat is shock absorbent, thereby eliminating the risk of injury. 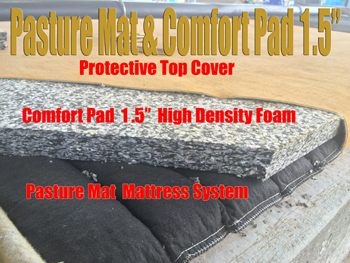 Pasture Mat is a multi-celled mattress filled with uniformly sized rubber crumbs. The mat is protected by a tough, top wear skin. It will not tear, stretch, deform or lose its shape. Non-organic Pasture Mat System does not support the production of bacteria. Pasture Mat's blend of components, crumb, size, degree of compaction and methods of assembly are the result of long, careful hours of observation and on-farm testing throughout Ontario.The result is revolutionary new cow mat that will not tear, stretch, deform or lose its resilience - and is also totally unaffected by urine, feces and the daily rigours of heavy use. The quality and durability built into Pasture Mat guarantees superior performance. Pasture Mat makes all other cows mats obsolete! Pasture Mat is installed quickly and easily - right on top of the existing concrete base. Saving you time and money. You don't throw away investment you've already made into your stalls. The "lifetime turf" nature of the Pasture Mat means you use less bedding material - Pasture Mat is the equivalent of at least three inches of bedding. You bed for hygiene, not comfort. Field tests in working barns prove that Pasture Mat reduces the cost of bedding and amount of labour needed to maintain clean stalls. It is safe to assume that any reduction in comfort-related stress is a desirable goal of herd management, with benefits that are likely to impact directly and positively on herd health, productivity and management costs. Poly Pillow(tm) is a soft, plastic arch that replaces concrete or wooden brisket barriers. Its gentle curves allow cows to step ahead on rising and permit natural leg extensions while lying down. 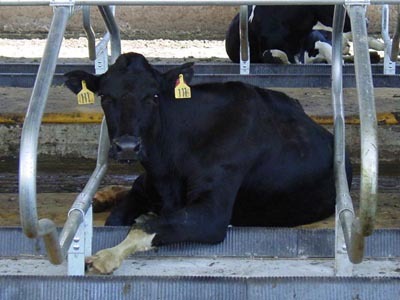 It keeps the cow from moving too far ahead in the stalls and allows natural lying positions. Ask your Dealer of more details on installing he Poly Pillow(tm) in Pack Mat stall. Pasture mat is economical, durable and low maintenance - putting extra dollars in your pocket! 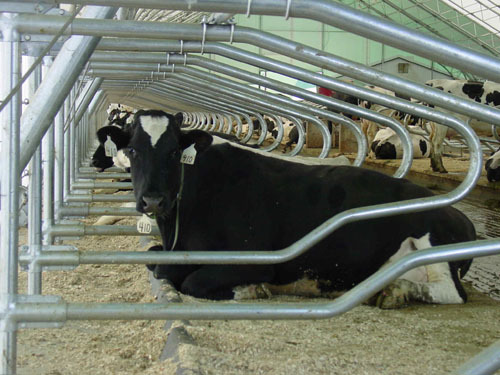 It is the ideal surface to keep your cows comfortable and contented. "The difference shows. My cows now spend most of their time lying down, and leg and hock injuries have been reduced dramatically. it's a good product. Our expenses for items like bedding have decreased by 75%. Healthier, injury free cows mean no medication, and no wasteful dumping of milk, too. The way things are going, we're hopeful that we can get an extra lactation from our cows before too long"
"I guess its common sense to use a mat that behaves just like natural pasture. I already had rubber mats in my stalls, but because my cows spend most of the time standing up I used to think they preferred it to lying down. We put Pasture Mats® right on top of those other mats and now you'd be hard pressed to find a single cow standing up!"